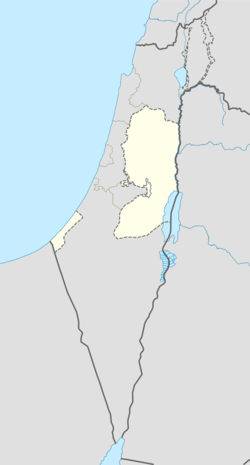 Al-Eizariya or al-Azariya (Arabic: العيزرية‎, "(place) of Lazarus"), sometimes referred to by its medieval name of Bethany, is a town mostly in Area C of the West Bank. According to the Palestinian Central Bureau of Statistics, it is the second largest Palestinian city in the Jerusalem Governorate (not including East Jerusalem), with a population of 17,606 inhabitants. Located on the southeastern slope of the Mount of Olives, less than 2 miles (3.2 km) from Jerusalem, the city is commonly identified as the site of the Biblical village of Bethany. The name al-Eizariya refers to the New Testament figure Lazarus of Bethany, who according to the Gospel of John, was raised from the dead by Jesus. The purported site of the miracle, the Tomb of Lazarus, in the city is a traditional pilgrimage site. Some believe that the present village of Bethany does not occupy the site of the ancient village; but that it grew up around the traditional cave which they suppose to have been at some distance from the house of Martha and Mary in the village; Zanecchia (La Palestine d'aujourd'hui, 1899, I, 445f.) places the site of the ancient village of Bethany higher up on the southeastern slope of the Mount of Olives, not far from the accepted site of Bethphage, and near that of the Ascension. It is quite certain that the present village formed about the traditional tomb of Lazarus, which is in a cave in the village... The site of the ancient village may not precisely coincide with the present one, but there is every reason to believe that it was in this general location." The Crusaders called al-Eizariya by its Biblical name Bethany. 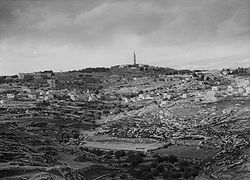 In 1138, King Fulk and Queen Melisende of Jerusalem purchased the village from the Latin Patriarch of Jerusalem in exchange for land near Hebron. The queen founded a large Benedictine convent dedicated to Sts. Mary and Martha near the Tomb of Lazarus. Melisende's sister Ioveta, thenceforward "of Bethany," was one of the first abbesses. Melisende died there in 1163; her stepdaughter Sibylla of Anjou also died there in 1165. Melisende's granddaughter Sibylla, also later Queen of Jerusalem, was raised in the abbey. After the fall of Jerusalem in 1187, the nuns of the convent went into exile. The village seems to have been abandoned thereafter, though a visitor in 1347 mentioned Greek Orthodox monks attending the tomb chapel. Yaqut al-Hamawi († 1229) described it as "A village near Jerusalem. There is here the tomb of Al Azar (Lazarus), whom Isa (Jesus) brought to life from being dead." In the 1480s, during the Mamluk period, Felix Fabri visited and described different places in the village, including a "house and storehouse" of Maria Magdalen, the house of Martha, the church of the sepulchre of Lazarus, and the house of Simon the Leper. He described the village as being "well-peopled", with the inhabitants being saracen. In 1517, the village was included in the Ottoman empire with the rest of Palestine, and in the 1596 tax-records it appeared as 'Ayzariyya, located in the Nahiya of Jabal Quds of the Liwa of Al-Quds. The population was 67 households, all Muslim. They paid taxes on wheat, barley, vineyards and fruit trees, occasional revenues, goats and beehives; a total of 14000 Akçe. The Ottomans built the al-Uzair Mosque and named it in honor of Lazarus, who is revered by both Christians and Muslims. For 100 years after it was constructed, Christians were invited to worship in it, but the practice was frowned upon by European church authorities who preferred for adherents of the faiths to remain separate. In 1838 Edward Robinson visited, and described it as a poor village of some 20 families. It was also noted as a Muslim village, located in the el-Wadiyeh region, east of Jerusalem. In 1870, the French explorer Victor Guérin visited the village. Socin found from an official Ottoman village list from about the same year showed that al-Eizariya had a population of 113, with a total of 36 houses, though the population count included men, only. Hartmann found that al-Azariya had 35 houses. In 1883 the Palestine Exploration Fund's Survey of Western Palestine described it (named El Aziriyeh), as a village on the side of a hill, with a ravine running down on the east side of it. The houses were built of stone. The village was dominated by the remains of a Crusader building. A mosque, with a white dome was built over what was traditionally the tomb of Lazaruz. A second small mosque, dedicated to a Sheik Ahmed, was located to the south of the village. Around 1890, Khalil Aburish, whose ancestors had officially been designated "guardians of the holy resting place of Lazarus", began promoting al-Eizariya as a tourist or pilgrimage destination. In 1896 the population of El-'azarije was estimated to be about 315 persons. In the early 20th century, visitors counted 40 family dwellings in the village. In 1917, it had about 400 residents. In the 1922 census of Palestine conducted by the British Mandate authorities, the village had a population of 506 Muslims and 9 Christians, where 2 of the Christians were Orthodox, and 7 Roman Catholics. 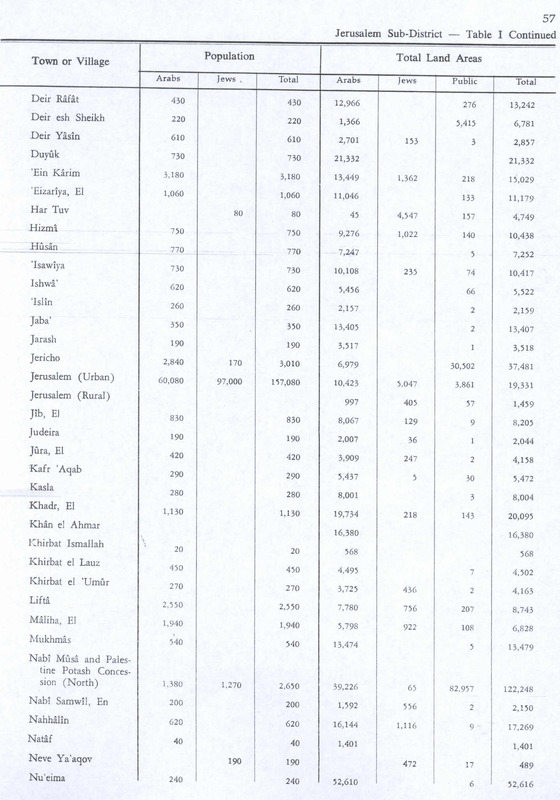 In the 1931 census of Palestine this had increased to 726 persons, 715 Muslims and 11 Christians, in 152 houses. The number included members of a Greek Convent. In the 1945 statistics, the population was 1,060; 1,040 Muslims and 20 Christians, while the total land area was 11,179 dunams, according to an official land and population survey. 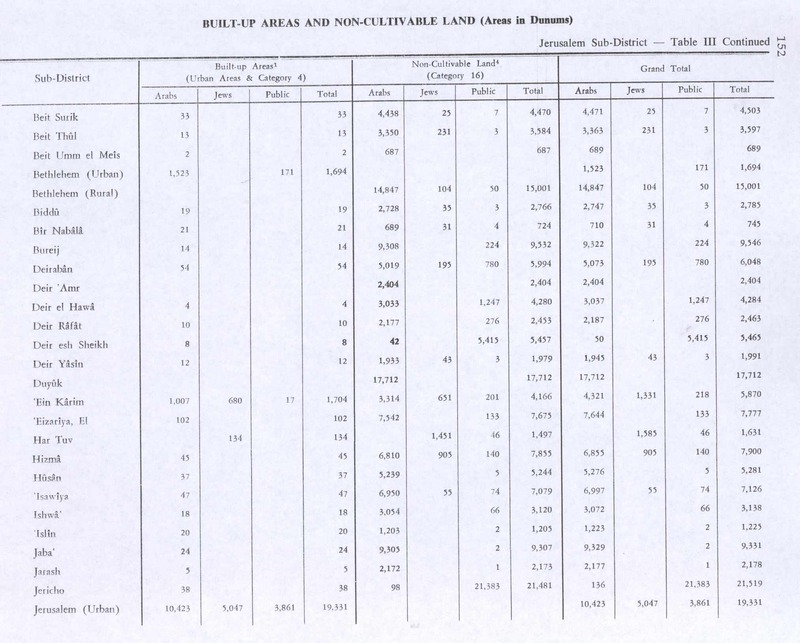 Of this, 43 were allocated for plantations and irrigable land, 3,359 for cereals, while 102 dunams were classified as built-up areas. In the 1948 Arab–Israeli War in 1948, and in the years 1948–1967 al-Eizariya was controlled by Jordan. In 1961, the population of Eizariya was 3,308. Israeli separation barrier at Abu Dis & Al-Eizariya, 1990s- 2004–2007. This shows a portion of the barrier built by Israel in the West Bank. This part is very close to the eastern part of Jerusalem, ~2 km from al-Aqsa Mosque. It's taken on the Israeli side of the wall, facing south. The local residents on both sides of the barrier at this point are predominantly Palestinians Families. After the Six-Day War in 1967, al-Eizariya was occupied by Israel, and lands to the east of the village were declared a closed military zone, cutting farmers off from the lentils and wheat crops they cultivated on the hilltops where Maaleh Adumim was later established. Today, the town is overcrowded due to rapid population growth and a lack of town planning. Much of the agricultural land that produced figs, almonds, olives and carob has been confiscated or cut down by Israeli authorities, or has been absorbed into the expanding built-up area of Al-Eizariya. After the 1995 accords, 87.3% of Al-Eizariya land was classified as Area C, under full Israeli control, while the remaining 12.7% is Area B, meaning that civil affairs have been under the control of the Palestinian National Authority and security matters under the control of the Israel Defense Forces. Israel has also confiscated land from Al-Eizariya in order to build two Israeli settlements: 4,217 dunams were confiscated for Ma'ale Adummim, while 2,749 dunams were taken for Mishor Adummim (Industrial Center). Many of the original inhabitants now live in Jordan, the United States, and the Arab states of the Persian Gulf. Real estate speculation and the opening of many bank branches briefly accompanied expectations that the Palestinian Authority would set up its seat of government in East Jerusalem. In 2000, about a quarter of the population, then 16,000, held Israeli ID cards. In 2004, the Israeli West Bank barrier was built across Eizariya's main road, curtailing the commerce in the strip of shops along the road, which drew both Arab and Jewish customers. Archaeological excavations between 1949 and 1953, directed by Father Sylvester J. Saller for the Franciscans of the Holy Land, revealed details of the previous Christian places of worship erected near the tomb. Four superimposed churches were discovered to the east of Lazarus's tomb, the earliest dated to the 4th or 5th century. Rock-cut tombs and the remains of houses, wine-presses, cisterns and silos were also unearthed. Pottery finds were dated to the Persian and Hellenistic periods. There are ongoing excavations at a site just beyond the House of Martha and Mary. The Tomb of Lazarus in al-Eizariya is a traditional pilgrimage destination. The tomb is the purported site of the miracle recorded in the Gospel of John in which Jesus raises Lazarus of Bethany from the dead. The site, sacred to both Christians and Muslims, has been identified as the tomb of the gospel account since at least the 3rd century CE. As the Catholic Encyclopedia of 1913 states, however, "It is quite certain that the present village formed about the traditional tomb of Lazarus, which is in a cave in the village. The identification of this [particular] cave as the tomb of Lazarus is merely possible; it has no strong intrinsic or extrinsic authority." Several Christian churches have existed at the site over the centuries. The first mention of a church is in the late 4th century, although Eusebius of Caesarea and the Bordeaux pilgrim mention the tomb. In 390, Jerome writes of a church dedicated to Saint Lazarus called the Lazarium. This is repeated by the pilgrim Egeria in 410. The present-day gardens contain the remnants of a mosaic floor from the 4th-century church. In 1143 the existing structure and lands were purchased by King Fulk and Queen Melisende of Jerusalem and a large Benedictine convent dedicated to Mary and Martha was built near the tomb of Lazarus. After the fall of Jerusalem in 1187, the convent was deserted and fell into ruin with only the tomb and barrel vaulting surviving. By 1384, a simple mosque had been built on the site. In the 16th century, the Ottomans built the larger al-Uzair Mosque to serve the town's (now Muslim) inhabitants and named it in honor of the town's patron saint, Lazarus of Bethany. Since the 16th century, the site of the tomb has been occupied by the al-Uzair Mosque. The adjacent Roman Catholic Church of Saint Lazarus, built between 1952 and 1955 under the auspices of the Franciscan Order, stands upon the site of several much older ones. In 1965, a Greek Orthodox church was built just west of the tomb. The house of Simon the Leper, which is known by locals as the Tower of Lazarus, is maintained by the Greek Orthodox Church. 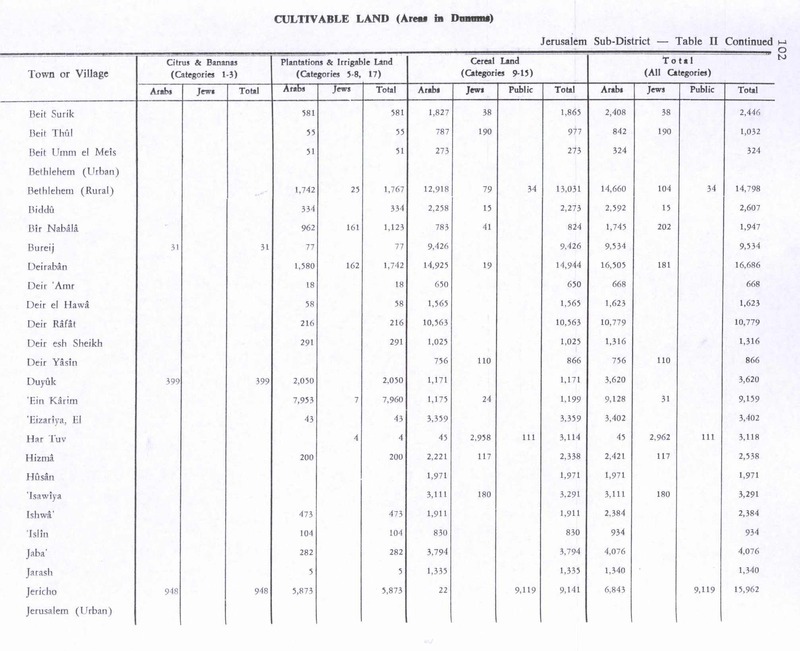 ^ Table 9: Localities in Jerusalem Governorate by Type of Locality and Selected Indicators, 2007, Main Indicators by Locality Type - January 2009 Archived November 14, 2010, at the Wayback Machine, p. 52. Palestinian Central Bureau of Statistics. ^ W. F. Albright (1922–1923). "Excavations and Results at Tell El-Fûl (Gibeah of Saul) by the Director of the School in Jerusalem". American Schools of Oriental Research, Annual. 4. pp. 158–160. Breen, Andrew Edward (1907). "Bethany" . In Herbermann, Charles (ed.). Catholic Encyclopedia. 2. New York: Robert Appleton Company. ^ a b Tomb of Lazarus, Bethany - Jerusalem, Sacred Destinations. ^ Mills, 1932, p. 39. ^ Land claim unsettles Israeli settlers; Peace Now says 40 percent of West Bank settlements sit on private Palestinian land. ^ Bethany:Introduction Archived 2012-06-20 at the Wayback Machine, Albert Storme, Franciscan Cyberspot. ^ The Onomastikon of Eusebius and the Madaba Map Archived 2004-05-05 at the Wayback Machine, Leah Di Segni. First published in: The Madaba Map Centenary, Jerusalem, 1999, pp. 115-120. ^ Bethany in Byzantine Times I Archived 2016-03-06 at the Wayback Machine and Bethany in Byzantine Times II Archived 2000-09-15 at the Wayback Machine, by Albert Storme, Franciscan Cyberspot. Aburish, S. (1988). Children of Bethany: the story of a Palestinian family. I.B.Tauris. ISBN 978-1-85043-109-1. Fabri, F. (1893). Felix Fabri (circa 1480–1483 A.D.) vol II, part I. Palestine Pilgrims' Text Society. Guérin, V. (1874). Description Géographique Historique et Archéologique de la Palestine. Vol 2 Samarie; pt. 1. Kark, R.; Oren-Nordheim, Michal (2001). Jerusalem and its environs: quarters, neighborhoods, villages, 1800-1948 (Illustrated ed.). Wayne State University Press. ISBN 978-0-8143-2909-2. Saller, Sylvester John (1982). Excavations at Bethany (1949-1953). Franciscan Printing Press. Shahin, Mariam (2005). Palestine: A Guide. Interlink Books. p. 332. ISBN 1-56656-557-X.